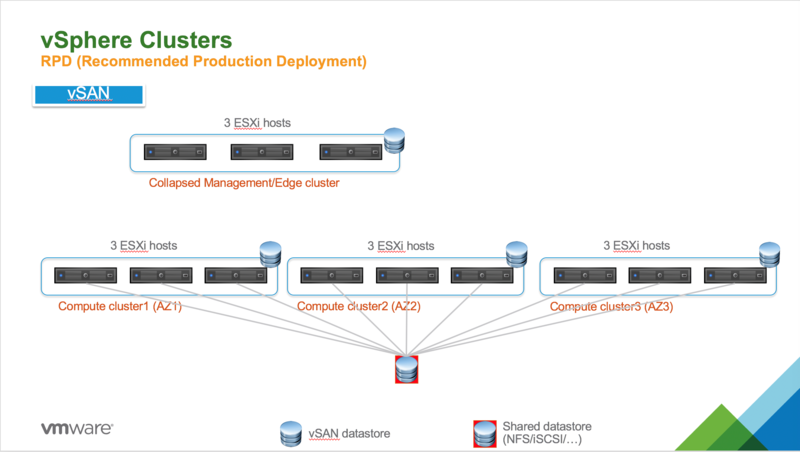 This topic provides hardware requirements for production deployments of Pivotal Container Service (PKS) on vSphere with NSX-T.
For more information on creating vSphere clusters, see Creating Clusters in the vSphere documentation. For more information, see Deploying NSX-T for PKS. 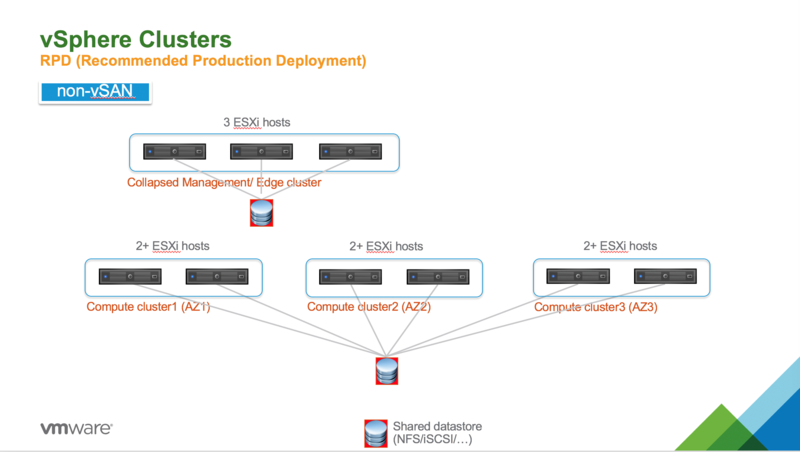 The PKS Edge Cluster on vSphere comprises two or more NSX-T Edge Nodes in active/standby mode. The minimum number of Edge Nodes per Edge Cluster is two; the maximum is 10. PKS supports running Edge Node pairs in active/standby mode only. For more information, see Installing PKS on vSphere with NSX-T. Depending on your design choice, PKS management components can be deployed in the PKS Management Cluster on the standard vSphere network or in the PKS Compute Cluster on the NSX-T-defined virtual network. For more information, see NSX-T Deployment Topologies for PKS. The vSphere Distributed Resource Scheduler (DRS) is enabled. For more information, see Creating a DRS Cluster in the vSphere documentation. The DRS custom automation level is set to Partially Automated or Fully Automated. For more information, see Set a Custom Automation Level for a Virtual Machine in the vSphere documentation. vSphere high-availability (HA) is enabled. For more information, see Creating and Using vSphere HA Clusters in the vSphere documentation. vSphere HA Admission Control (AC) is configured to support one ESXi host failure. For more information, see Configure Admission Control in the vSphere documentation. The recommended production deployment (RPD) topology represents the VMware-recommended configuration to run production workloads in PKS on vSphere with NSX-T. Note: The RPD differs depending on whether you are using vSAN or not. The RPD for PKS with vSAN storage requires 12 ESXi hosts. The diagram below shows the topology for this deployment. The following subsections describe configuration details for the RPD with vSAN topology. Collapsed Management/Edge Cluster with three ESXi hosts. Each ESXi host runs one NSX-T Controller. The NSX-T Control Plane has three NSX-T Controllers total. Two NSX-T Edge Nodes are deployed across two different ESXi hosts. Each Compute cluster has three ESXi hosts and is bound by a distinct availability zone (AZ) defined in BOSH Director. Compute cluster1 (AZ1) with three ESXi hosts. Compute cluster2 (AZ2) with three ESXi hosts. Compute cluster3 (AZ3) with three ESXi hosts. Each Compute cluster runs one instance of a PKS-provisioned Kubernetes cluster with three master nodes per cluster and a per-plan number of worker nodes. An external shared datastore (using NFS or iSCSI, for instance) must be provided to store Kubernetes Pod PV (Persistent Volumes). Three ESXi hosts are required per Compute cluster because of the vSAN cluster requirements. For data protection, vSAN creates two copies of the data and requires one witness. For more information on using vSAN with PKS, see PersistentVolume Storage Options on vSphere. The collapsed Management/Edge Cluster can be expanded to include up to 64 ESXi hosts. Each Compute Cluster can be expanded to include up to 64 ESXi hosts. The RPD for PKS without vSAN storage requires nine ESXi hosts. The diagram below shows the topology for this deployment. The following subsections describe configuration details for the RPD of PKS without vSAN. Each Compute cluster has two ESXi hosts and is bound by a distinct availability zone (AZ) defined in BOSH Director. Compute cluster1 (AZ1) with two ESXi hosts. Compute cluster2 (AZ2) with two ESXi hosts. Compute cluster3 (AZ3) with two ESXi hosts. All Compute Clusters are connected to same shared datastore that is used for persistent VM disks for PKS components and Persistent Volumes (PVs) for Kubernetes pods. All datastores can be collapses to single datastore, if needed. The minimum production deployment (MPD) topology represents the baseline requirements for running PKS on vSphere with NSX-T. 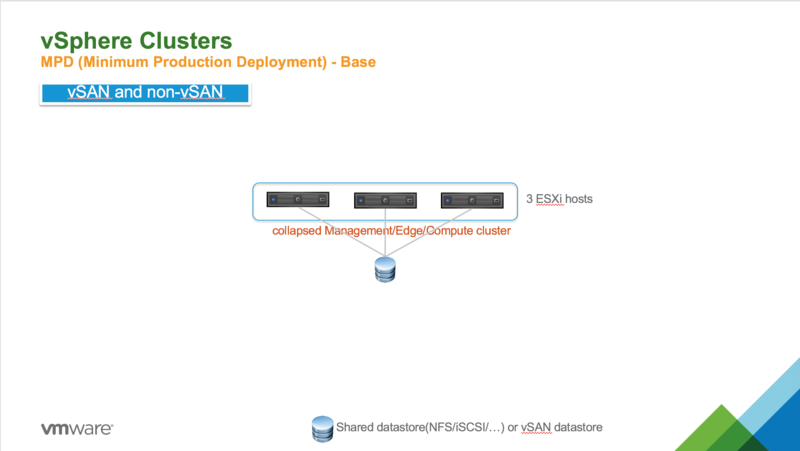 Note: The MPD topology for PKS applies to both vSAN and non-vSAN environments. The diagram below shows the topology for this deployment. The following subsections describe configuration details for an MPD of PKS. A single collapsed Management/Edge/Compute cluster running three ESXi hosts in total. Each ESXi host runs one NSX-T Controller. The NSX-T Control Plane has three NSX-T Controllers in total. Each ESXi host runs one Kubernetes master node. Each Kubernetes cluster has three master nodes in total. The shared datastore (NFS or iSCSI, for instance) or vSAN datastore is used for persistent VM disks for PKS components and Persistent Volumes (PVs) for Kubernetes pods. The collapsed Management/Edge/Compute cluster can be expanded to include up to 64 ESXi hosts. Note: For an MPD deployment, each ESXi host must have four physical network interface controllers (PNICs). In addition, while a PKS deployment requires a minimum of three nodes, PKS upgrades require four ESXi hosts to ensure full survivability of the NSX Manager appliance. When deploying the NSX-T Controller to each ESXi host, create a vSphere distributed resource scheduler (DRS) anti-affinity rule of type “separate virtual machines” for each of the three NSX-T Controllers. When deploying the NSX-T Edge Nodes across two different ESXi hosts, create a DRS anti-affinity rule of type “separate virtual machines” for both Edge Node VMs. For more information on defining DRS anti-affinity rules, see Virtual Machine Storage DRS Rules in the vSphere documentation. Leverage vSphere resource pools to allocate proper hardware resources for the PKS Management Plane components and tune reservation and resource limits accordingly. There is no fault tolerance for the Kubernetes cluster because PKS Availability Zones are not fully leveraged with this topology. At a minimum, the PKS AZ should be mapped to a vSphere Resource Pool. For more information, see Creating the PKS Management Plane and Creating the PKS Compute Plane. The following tables list the VMs and their sizes for deployments of PKS on vSphere with NSX-T. The following table lists the resource requirements for each VM in the PKS infrastructure and control plane. The following table lists the resource requirements for each VM in the Edge Cluster. Note: NSX-T Edge Nodes must be deployed on Intel-based hardware. The following table lists sizing information for Kubernetes cluster node VMs. The size and resource consumption of these VMs are configurable in the Plans section of the PKS tile. For illustrative purposes, the following table shows sizing information for two example Kubernetes clusters. Each cluster has three master nodes and five worker nodes. The following tables list the hardware requirements for RDP and MPD topologies for PKS on vSphere with NSX-T. The following table lists the hardware requirements for the RPD with vSAN topology. Note: The Total Cores per Host values assume the use of hyper-threading (HT). The following table lists the hardware requirements for the RPD without vSAN topology. The following table lists the hardware requirements for the MPD topology with a single (collapsed) cluster for all Management, Edge, and Compute nodes. To add hardware capacity to your PKS environment on vSphere, do the following: 1. Add one or more ESXi hosts to the vSphere compute cluster. For more information, see the VMware vSphere documentation. 1. Prepare each newly added ESXi host so that it becomes an ESXi transport node for NSX-T. For more information, see Prepare ESXi Servers for the PKS Compute Cluster.